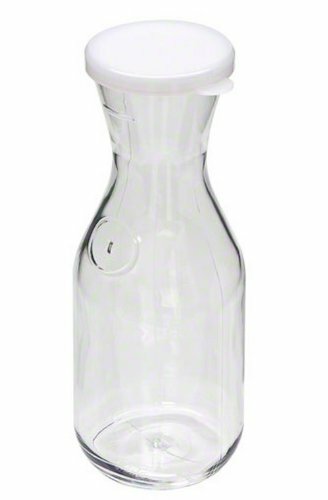 25 O (.74 L), 3.13 inch Decanter W/lid, 8.5 inch tall. Break resistant/ shatter resistant. Dishwasher safe. Made in Taiwan. 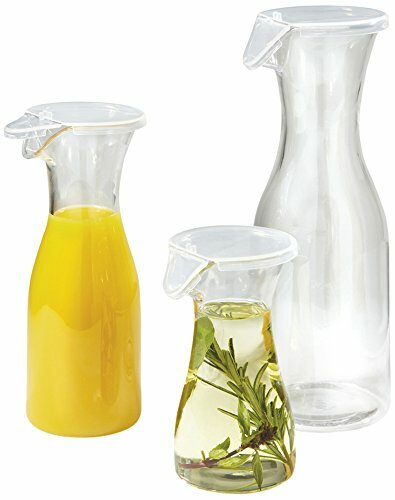 The half liter Carlisle cascata carafe is perfect for salad dressings, syrups, single-portion drinks, and snack mix. 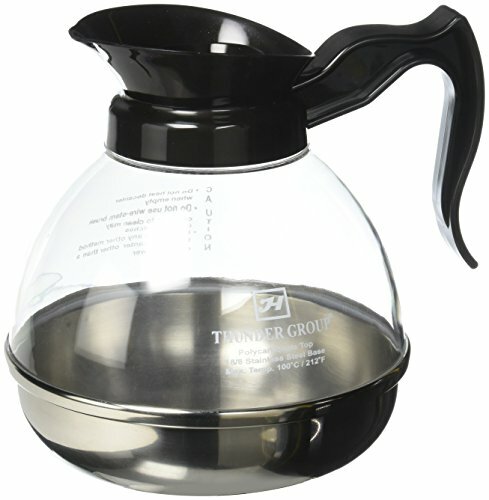 The ergonomic shape is easy to hold and the angled rim provides a drip-free pour. Capacity marks make portion control easy. The shatterproof polycarbonate looks like glass. Solid and hinged style snap-on lids are available from Carlisle (sold separately). Dishwasher safe and NSF listed. 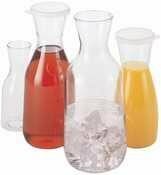 Camwear Camliter beverage decanter is ideal for serving juice or wine on buffet lines or table side. Made of virtually unbreakable polycarbonate. Lightweight design is easy to handle and safer than glass. Spill-proof snap tight lids reduce spills. Use to cover and store contents. Pour spout lid protects contents while allowing a free pour. Comes in 1-liter capacity. Available in clear color. Made of polycarbonate body with stainless steel base for added support and more resistant to breakage. Durable plastic handles Color coded in black for regular. Drip proof and fast pouring lip. Perfect for both home and commercial use. The Camwear Camliter Beverage Dispenser is ideal for serving juice or wine on buffet lines or table side. Camliters ship with spill-proof snap tight lids that reduce spills. Durable polycarbonate construction, 1/2 liter capacity, Ideal for serving juice and wine, NSF certified product, Dishwasher safe. 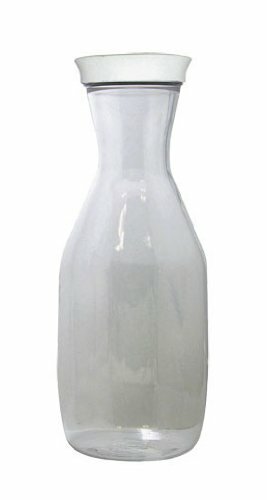 The polycarbonate decanter is an excellent choice for almost any restaurant or cafe. This decanter is made from remarkably durable polycarbonate that resists scratching and practically can't be shattered. 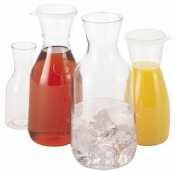 Perfect for serving juice, water or soft drinks, this decanter also features a screw on lid for easy refilling and a flip top that makes pouring easier than ever while minimizing spills. Comes in 33-ounce capacity should be plenty for most typical situations. Copyright © Wholesalion.com 2019 - The Best Prices On Polycarbonate Beverage Decanter Online.